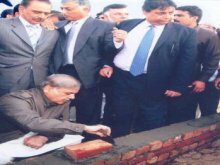 CHIEF Minister Muhammad Shahbaz Sharif has granted approval to the launching of Aashiyana Housing Scheme for low-income people in Faisalabad, Sargodha, Jehlum and Sahiwal on the pattern of Lahore and directed start of work on the schemes as early as possible. He was presiding over a meeting regarding Aashiyana Housing Project here on Tuesday. Punjab Land Development Company Chairman Sheikh Alauddin, commissioners and district coordination officers of Lahore, Faisalabad, Rawalpindi, Sargodha and Sahiwal were also present. The chief minister said that Aashiyana Housing Scheme for low-income people had been initiated first time in the history of the country which was an important step towards transforming the country in accordance with the vision of Quaid-e-Azam and Allama Iqbal. He said that Aashiyana Housing Scheme was a coordinated project and houses were being constructed for the poor at high value land near cities. He said basic amenities would be available in the housing schemes. He said the houses would be allotted through ballot. He said that Aashiyana Housing Schemes would be completed in all districts under the umbrella of the Punjab Land Development Company while the DCOs concerned would serve as resident directors.